A few days ago, I documented here on ShukerNature the rediscovery of a forgotten melanistic mystery beast – Brevet’s black Malayan tapir. Now, a second such case has come to my attention. Isn’t it amazing what you can uncover on clip-art sites? While browsing through various of these a couple of nights ago in search of some public-domain animal images for various future writing projects, I came upon the remarkable engraving that opens this present ShukerNature blog post. It was labelled as an indri, but as can readily be observed here, what is so intriguing and unexpected about it is that it is almost entirely black. Only its face and brow, its hands and feet, and its throat appear somewhat paler in hue; the remainder of its body is totally black. 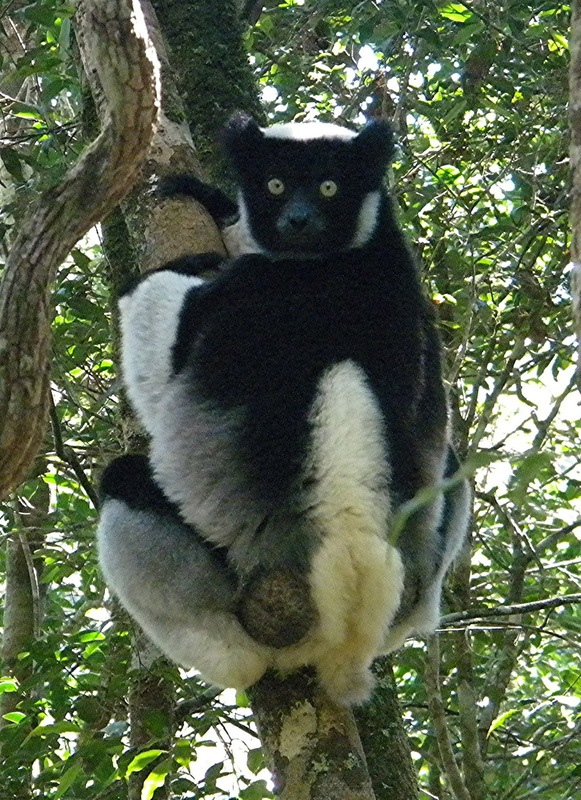 The indri or babakoto Indri indri is famous not only for being arguably the largest species of lemur known to be alive today on Madagascar (the diademed sifaka Propithecus diadema runs it an extremely close second), but also for its very striking black and white pelage. “Towards the southern limits, the basic colour is black with creamy-white patches on the crown, nape and throat, base of the back, fore-arms, thighs and lower legs – these areas may also be tinged with silver-grey or pale creamy-yellow. The face and muzzle are black and the ears are round, tufted and prominent. The eyes are yellow-green. 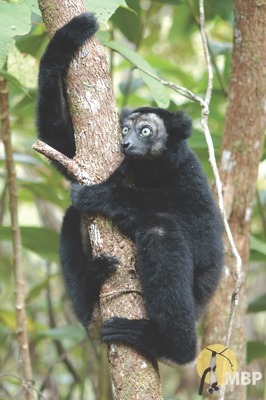 “At the northern extreme of the Indri’s range pelage pattern is very different. Again the base colour is black, but pale grey and white regions are far less evident. The inner face is black, surrounded by a white facial disc which extends down the throat. There are white areas on the sides of the abdomen which extend under the armpits and there is a white pygal triangle at the base of the back which continues to the rump and includes the vestigial tail; the heels may also be pale grey or yellowish-white. White areas are completely absent on the forearms and upper hindlimbs. Investigating the near-black indri engraving further, I discovered that it had originated from S.G. Goodrich’s book The Animal Kingdom Illustrated (A.J. Johnson & Co: NY, 1885), appearing on p. 119. 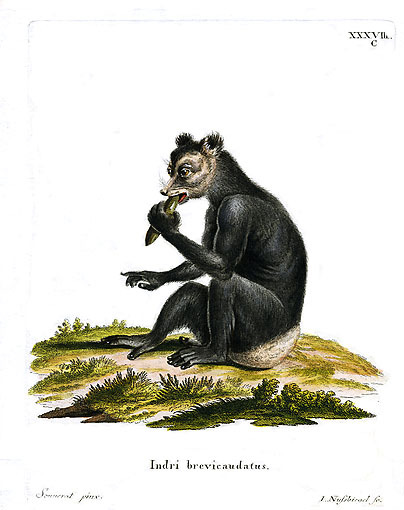 Could there be any other antiquarian illustrations of black or near-black indri specimens online, I wondered. Despite spending a fair length of time pursuing this possibility, however, only two came to light, neither of which corresponded with the specimen from Goodrich’s tome. The animal depicted in the first of these images, reproduced above, is certainly all-black but is quite evidently not an indri at all. This is evinced not simply by its very long tail (the indri, conversely, is noted for being the only near-tailless modern-day lemur – hence its binomial synonym Indri brevicaudatus – ‘short-tailed indri’), but also by its entire morphology. For this compares closely in size and proportions with one of the much smaller, true lemurs. I have been unable to ascertain the original source for this illustration. In contrast, the second image, produced by French naturalist Pierre Sonnerat and derived from Johann von Schreber’s series of animal tomes Die Säugthiere in Abbildungen nach der Natur mit Beschreibungen (Wolfgang Walter: Erlangen, 1775-92), and which is reproduced below, definitely shows an indri. 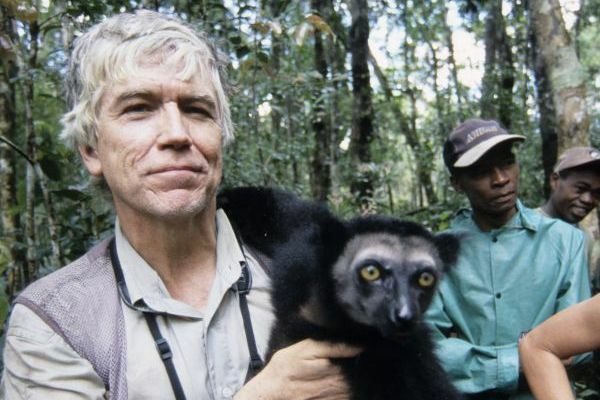 Moreover, it corresponds well with Garbutt’s above-quoted description of northern indri specimens. 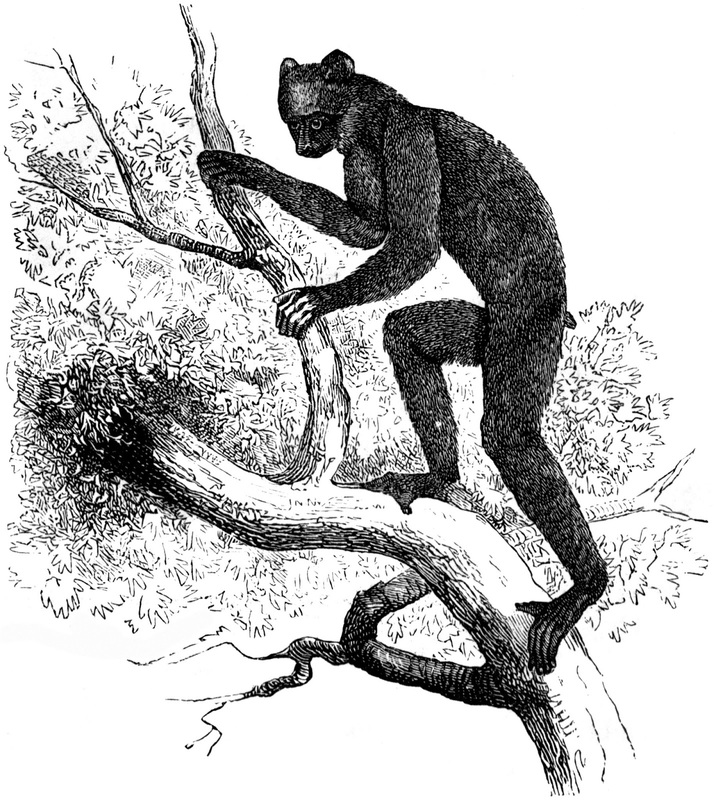 So was Goodrich’s engraving based upon an extreme example of the northern indri, or perhaps even upon a melanistic specimen of the southern indri – or could it simply have been an inaccurate illustration, possibly based only upon verbal descriptions, rather than upon physical specimens directly viewed by the artist? Was it even an indri at all? With regard to this last-mentioned query, I did notice on a couple of websites that had reproduced this image the suggestion that perhaps it was a late-surviving relative of one of the officially-extinct giant lemurs. 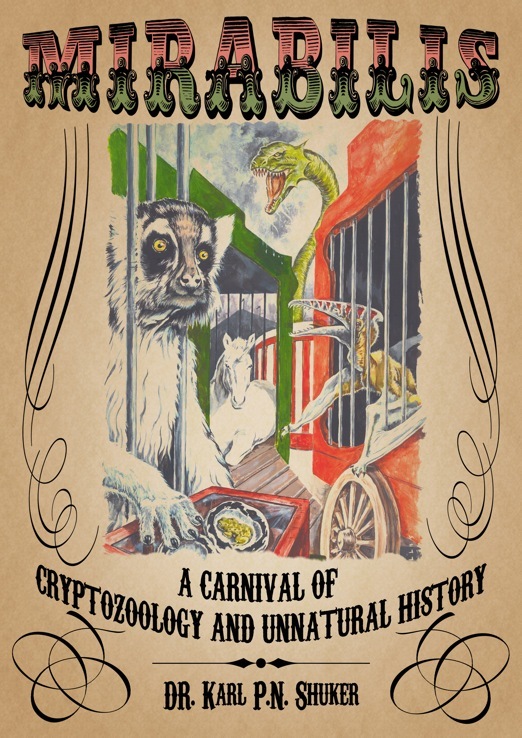 As documented extensively within my latest book, Mirabilis: A Carnival of Cryptozoology and Unnatural History (2013), that same explanation has also been proposed in relation to certain other Madagascan mystery beasts, such as the tratratratra, tokandia, and habéby. 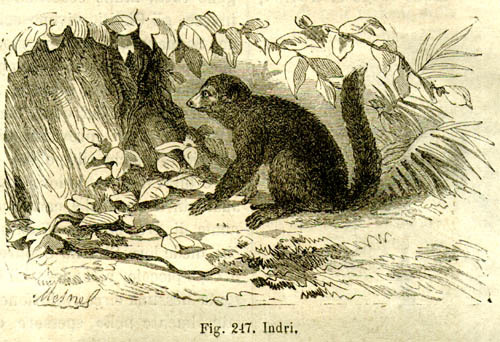 In this particular instance, however, the morphology of the animal in Goodrich’s engraving is sufficiently detailed for there to be no doubt whatsoever that it is indeed intended to represent an indri – only the predominantly black colour of its pelage marks it out as different from more typical indri specimens. In any case, there is also some wholly independent, and very exciting, proof to hand that readily confirms its identity as an indri. Namely, the current existence of living identical near-black specimens! Nestled within the rugged mountains of northeastern Madagascar is the Anjanaharibe-Sud Special Reserve, which currently protects 42,488 acres of rainforest on the eastern slopes of the Anjanaharibe Massif, and is home to a number of very rare and unusual animals and plants – including what is referred to there as the black indri. 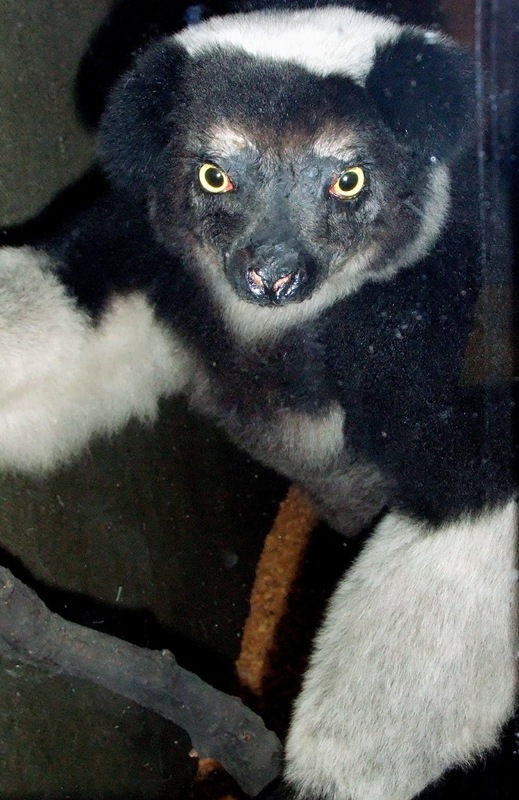 As its name reveals, this very distinctive form of indri is predominantly black, with only its face, hands, feet, and throat (plus in some specimens its rump, and/or a strip above its haunches) introducing any paler colouration. If such an extreme variety as this can exist today, as indeed it does, I see no problem in accepting that comparably dark-furred individuals were thriving little more than a century ago – especially as even now, little is known about the black indri of Anjanaharibe-Sud. Also worth remembering is that far more rainforest was still present back in those times, before great swathes were felled during modern-day legal and (particularly) illegal logging activity, which means that much more habitat was available then to sustain these largest of living lemurs. In short, I consider it likely that the mysterious near-black indri depicted in Goodrich’s engraving was a northern indri specimen displaying extremely restricted paler pelage colouration. Another melanistic mystery mammal from the past duly revived and identified.